A few days ago I was hanging out with my cousin and she asked me to do a quick mani for her. 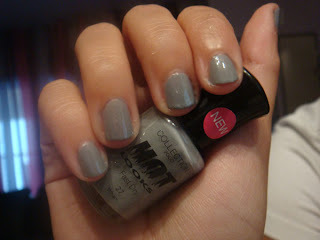 As grey is really in this season and she wanted to try a grey mani, this is what I came up with. A cool grey manicure with purple sparkles. She got a lot of compliments on the look so here is a quick run down of the process. After applying base coat, I applied two coats of Collection 2000 in Wham, a lovely creme grey. 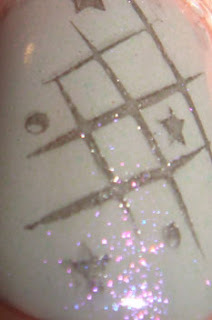 Then using Chez-Delaney image plate H3 and a black nail polish from Miss Sporty (which I find perfect for nail stamping) I stamped this image on every nail. In the end I used a coat of CND's amethyst sparkle and a coat of Seche and voila! this came out great! 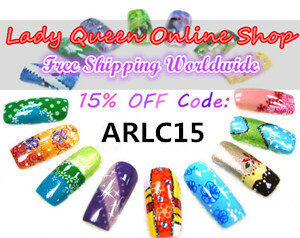 I love your choice of polish and design, the grey is so chic! Wow, you did a great job...her nails are gorgeous. It took me three coats from Miss Sporty's black for an opaque finish. i've never seen this image before. very cute! I have amethyst sparkle and haven't used it yet, looks great over grey!